On 8th May, Response Network hosted two staff members ( Huyen Nguyen and Brit Sandnes) from Norad, one of the key partners of Response Network. Norad has been supporting Response Network since 2010.The visit was aimed at understanding how programs were being run and how RN was cooperating with Community Based Rehabilitation (CBR) another organization funded by Norad. CBR offices are just a stone throw from Response Network and is working with people living with disabilities. The management team at Response Network explained how all the programs are run and how Self-help Facilitation concept is rolled out in the rural communities. After all was done and dusted, the visitors appreciated the meeting and information they had been given. They felt Response Network was on track in mobilizing communities towards self-sustenance. 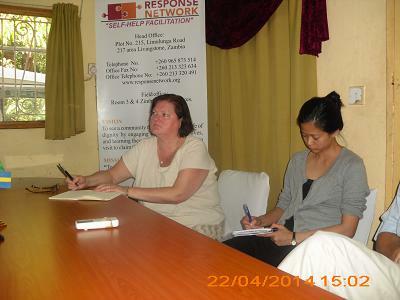 And speaking during the same meeting, the two NORAD visitors, Huyen Nguyen and Anne Brit Sandnes urged the organization to continue with the self help facilitation concept so that vulnerable people engage in self driven development to improve their living standards.